Mexico has asked the US for detailed information on a law enforcement operation that allegedly allowed guns to be smuggled across the border. The request follows media reports that US federal agents allowed hundreds of guns to be smuggled into Mexico in the hope of tracking the weapons to drug cartel leaders. Some of the guns were reportedly later used in crimes including murder. US Attorney General Eric Holder has already ordered an inquiry. The Mexican request comes days after US President Barack Obama and his Mexican counterpart Felipe Calderon agreed to step up cooperation against guns and drugs trafficking. The tracking operation, codenamed Fast and Furious, was conducted by the US Bureau of Alcohol, Tobacco and Firearms (ATF), according to CBS and the Los Angeles Times. The ATF reportedly allowed 1,765 guns to be smuggled into Mexico over a 15 month period, including assault weapons and high-powered sniper rifles. Of those guns, 797 were recovered on both sides of the border. Many are thought to have been used in crimes, including two that were recovered at the scene of the killing of a US border protection agent in Arizona. 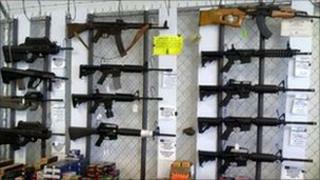 The ATF allowed the operation to continue despite objections from some agents involved, the LA Times reported. The BBC's Andrew North in Washington says the operation was kept secret from the Mexican government. In a statement, the Mexican foreign ministry said it would follow US Justice Department and ATF investigations into the operation with "special interest". "The aim of the governments of Mexico and the US is to stop the trafficking of arms on the basis of shared responsibility, and both sides are working to strengthen bilateral cooperation on this issue," it said. Mexico has long pressed the US authorities to do more to stop weapons smuggling across the border. Nearly 35,000 people have died in drug-related violence in Mexico since December 2006, and many of the killings have been carried out with guns smuggled in from the US.